100% Plastic playing cards made by Cartamundi. POKER SIZED Playing cards especially designed for playing poker. Professional playing cards renowned by casinos and poker players. 2 corner Jumbo index for clear card recognition. The plastic has a high quality matte finish and feel. High definition print with Black patterned back. Waterproof and washable, crimp and fade resistant. Extremely durable, resilient and long lasting. Pack contains 52 Playing Cards & 2 Jokers. Pack comes cello-wrapped in a full colour tuck box. Plastic Playing Card Width: 63mm. Plastic Playing Card Height: 88mm. Plastic Playing Card Thickness: 0.30mm. Cartamundi make some of the finest Copag plastic playing cards in the world, they are renowned by professional poker players and casinos throughout the UK, Europe and America. 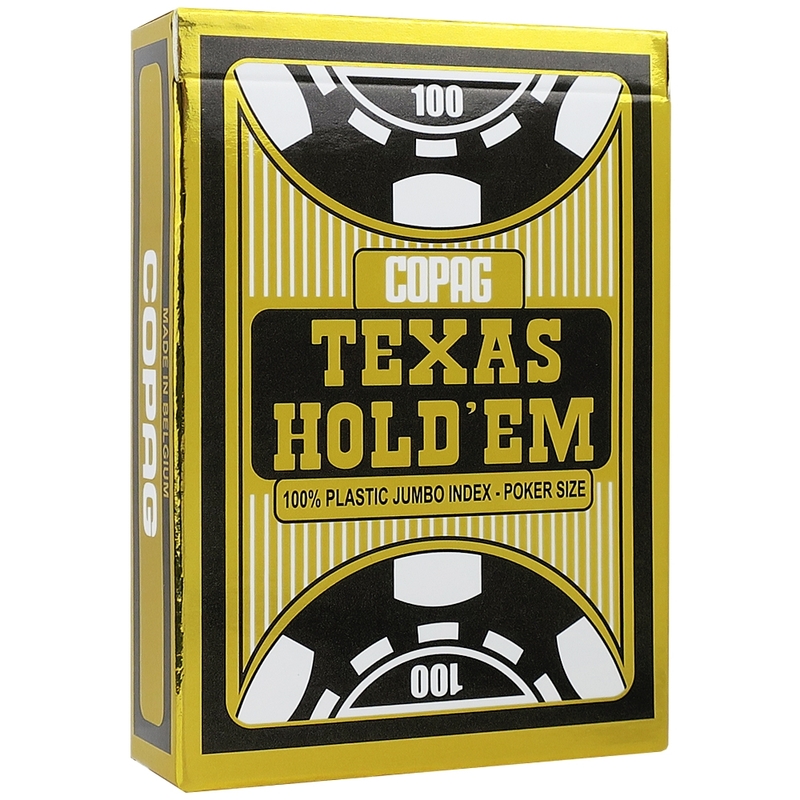 These Copag Gold Black Texas Hold'em 100% plastic playing cards are poker sized, have a 2 corner Jumbo index for clear card recognition and a symmetrical weave patterned back. This Copag Gold Texas Hold'em plastic playing card deck comes with 52 playing cards, 2 Jokers and is cello-wrapped and packed in a protective coloured box. Please Note: Colour shades may vary depending on your viewing screen.